We had published a story on December 9, 2013 Speed Breakers are ‘Life Breakers’ in Belgaum, and we now know that Sachin Shinde (37) is battling for his life in hospital and is in coma. Son of a paralyzed mother, Sachin was going home to feed his mother when he did not see the road hump near the Veer soudha cross and lost his balance and fell down from his bike. He was admitted to hospital but his condition is still critical and his mother has still not been informed about this. It is believed that these road humps were put after instruction from corporator Pandhari Parab. Each one even in the corporation is aware that these road humps are unscientific but no one is taking the pains to remove the same. Are we awaiting another tragedy to happen. And this is not the case with just one Sachin Shinde there could many more who have suffered injuries, maybe it is time for the residents only to get up in arms and remove them or see that they are made according to the IRC standards. Not only speed breakers but even roads are built Unscientific.Good example, if we start coming down from railway over bridge towards goavaes, we find taar put in the shape of snake. If you put a two wheeler on that, its for sure we are going to be tossed out. 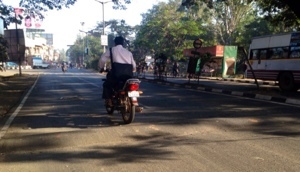 But such danger is not noticed by authority, as they will always be in their posh 2 wheelers. If it is necessary at that particular place, let the speed breakers be, at least the concerned authority should put up sign boards some distance ahead of it, cautioning the driver about it, and please use some good quality markers (if they remember to use it) on the speed breakers, so that they do not get erased within a day or two. The white markers used are of no quality at all. Putting warning boards will help the citizens a lot. These types of unscientific speed breakers are built without any reason or before making proper arrangements such as sign boards and marking near the speed breakers.Many times we hear that against such acts,a case is filed in the court,so that such things will not be done henceforth. Is it possible to file the case in the court? if so whether any lawyer will come forward in the interest of the public.